Orthoptera is a taxonomic order of insects, which include grasshoppers, crickets, and locusts. They were created by God on Day 6 of Creation along with the animals. The body of Orthoptera can be divided into three parts: head, thorax, and abdomen. The head contains the face and the antennae. The thorax contains the legs and wings. The abdomen contains with reproductive organs. Most Orthoptera can produce sounds. They produce sounds to attract mates, to alarm, and to protect their territories from others. (Usually, the male Orthoptera produce the sounds.) By volume and pitch of the sounds, species can be distinguished. Males rub their wings or legs to produce the sounds. Some of the species grind jaws to produce the sounds. 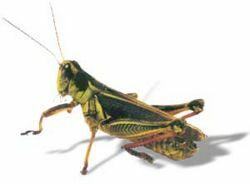 The grasshoppers rub the inside of their jumping legs on edges of their forewings to make the sounds. When they spread their wings, the sounds are amplified. 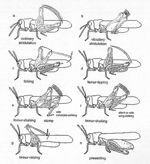 The Orthoptera like to live themselves. There are exceptions. 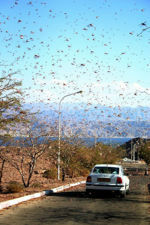 Sometimes the locusts or grasshoppers unite together as massive swarms. These kinds of swarms are disasters to farmers. This page was last modified on 28 July 2014, at 22:49.